The Chevrolet Suburban has never compromised. 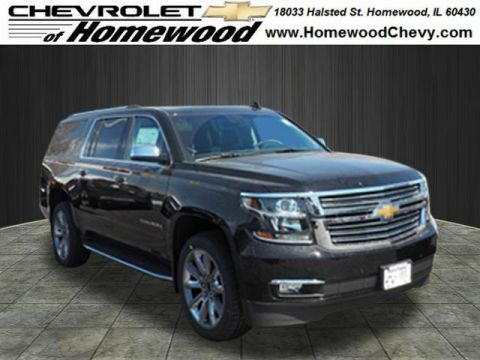 With seating for up to nine people, the ability to tow up to 8,300 pounds, and available features that you’d expect to find in a luxury vehicle, it’s a full-sized SUV that can do everything you need it to do around Chicago Heights and Chicago. Just take a look at our selection of Chevy Suburban models for sale. 2019 Chevrolet Suburban Premier New Price! Summit White 2019 Chevrolet Suburban Premier 4WD 6-Speed Automatic EcoTec3 5.3L V8 4-Wheel Antilock Disc Brakes, ABS brakes, AM/FM Stereo w/Navigation, Compass, Electronic Stability Control, Fog Lamps, Front dual zone A/C, Heated door mirrors, Heated front seats, Heated rear seats, Illuminated entry, Low tire pressure warning, Power Folding & Adjustable Heated Outside Mirrors, Power Liftgate, Power-Adjustable Accelerator & Brake Pedals, Remote keyless entry, Traction control, Wheels: 20 x 9 Polished-Aluminum.Recent Arrival! 2019 Chevrolet Suburban Premier Black 2019 Chevrolet Suburban Premier 4WD 6-Speed Automatic EcoTec3 5.3L V8 4-Wheel Antilock Disc Brakes, ABS brakes, AM/FM Stereo w/Navigation, Compass, Electronic Stability Control, Fog Lamps, Front dual zone A/C, Heated door mirrors, Heated front seats, Heated rear seats, Illuminated entry, Low tire pressure warning, Power Folding & Adjustable Heated Outside Mirrors, Power Liftgate, Power-Adjustable Accelerator & Brake Pedals, Remote keyless entry, Traction control, Wheels: 20 x 9 Polished-Aluminum. What Can a Chevy Suburban Do for Me? 39.3 cubic feet of cargo space behind the third-row seats. 121.7 cubic feet of maximum cargo space. Seating for up to nine people. Max towing capacity of 8,300 pounds. Up to 22 mpg highway. Up to 14 charging locations within the vehicle. In short, the new Suburban can do it all — and then some. 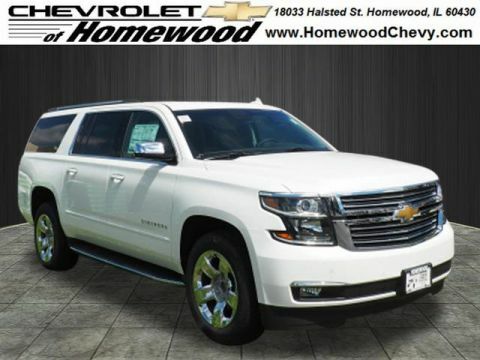 If you’re interested in taking a test drive in a Chevy Suburban for sale near Frankfort, just visit Chevrolet of Homewood today! Or, if you already know the Suburban is for you, you can apply for financing online.